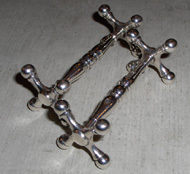 A beautiful pair of Krosno knife rests with clear centres and mouthblown black ball shaped ends. known as "Polish Art" they are of particularly good quality. Size (each) 5" long x 1,25" high.